Stage I is all most done and concentration is on exhaust side cause of Erland at topplocksverkstan.se. 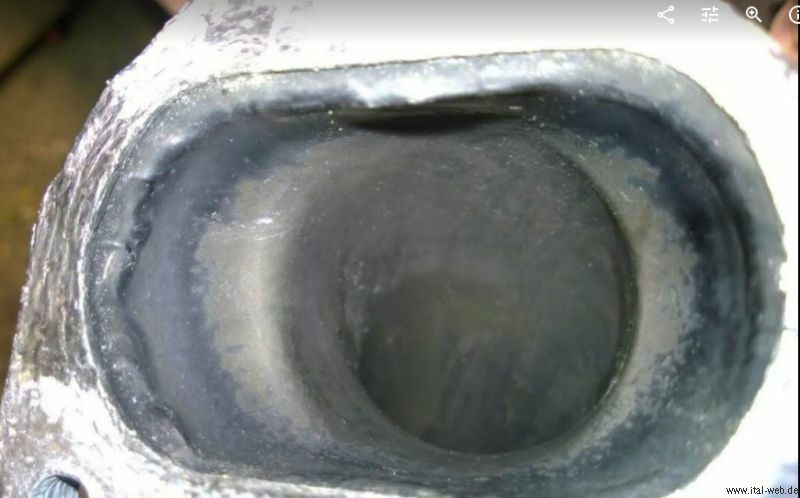 He analyzed 9,5 engine with Pipemax software http://maxracesoftware.com/PipeMaxPro400.htm And found exhaust is limiting RPM and HP. Too small valves or too little lift. I vill not change cam or bigger valves, but try to compensate a bit. 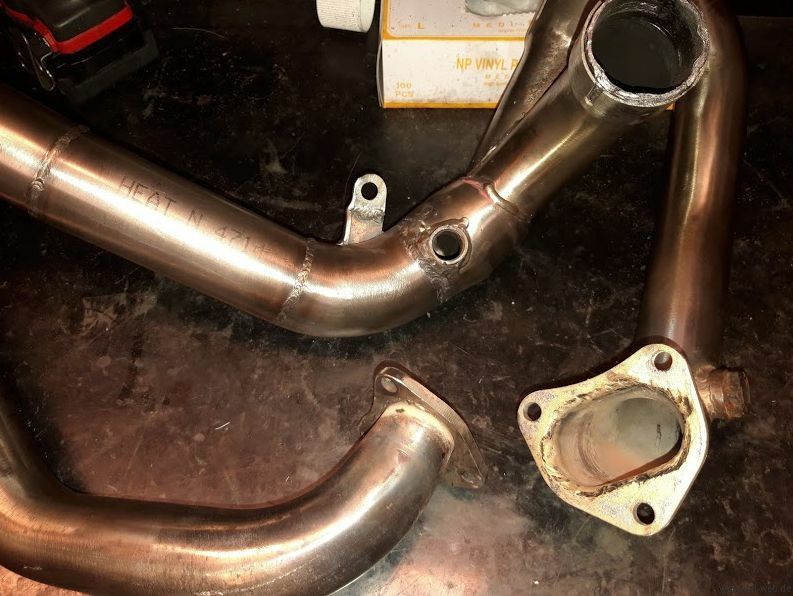 So i sent exhaust tubes to Mr. Zombie and once more he did some magic on them. 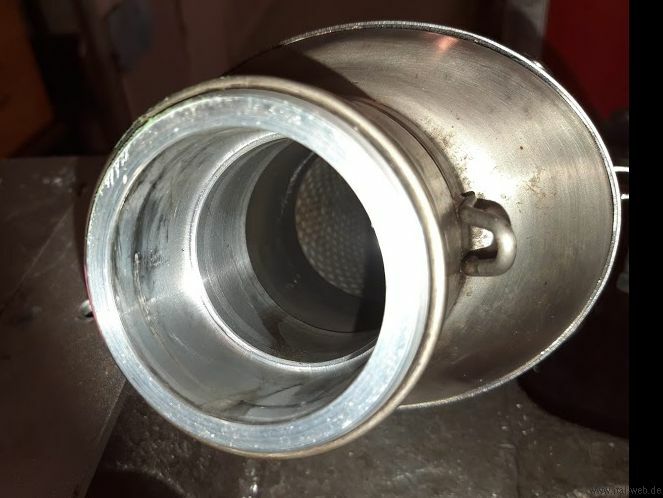 Off with sharp edges next to heads, Catalysator bucket off (makes unwanted pulses) and he even made a beautiful adaptor for more noisy SC-project Titanium Oval muffler. And just in case i ordered a new air filter to ensure there is no unnecessary restrictions on intake side either. 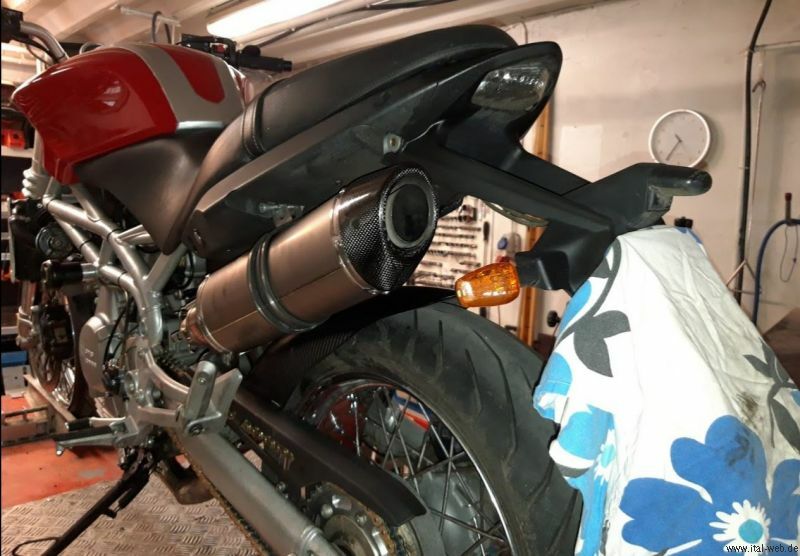 As final touch tubes will be painted with TechLine paint to keep heat in, exhaust gas speed up and me hopefully sweating less on hot summer day. 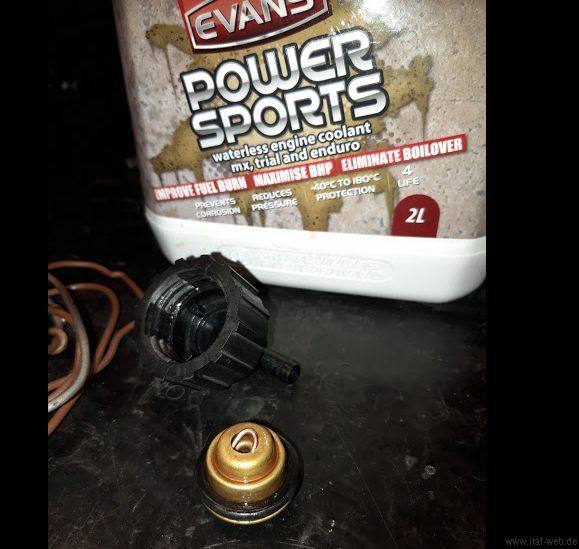 It can be done cause Evans does not boil and create pressure. Mod is to ensure expansion does create any pressure either. And as you know Evans is not corrosive and do not age. Yes it looks even better i imagined first. Shape is great and carbon visually fits together with carbon rear mudguard. I also glass bead blasted muffler so welding is now less visible and no shiny points left. Bike is washed and all plastic parts treated with Autoglym bumper & trim gel. Original plastic ball joints are crap. After replacing them with joints from Weber carburetors some adjustments was needed and i prefer most high vacuum. 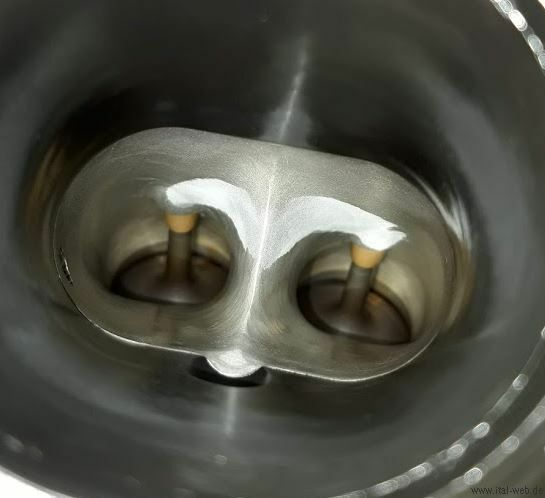 This why i completely shut down those valves we normally synchronize intakes with and balanced them 'mechanically' with this screw (arrow) It does not alter TPS value. Balancing was done at 2,5-3krpm. And balancing helped a lot. Engine became more smooth. When installing blow by valve it is very important to have both holes centered. Valve should be very easy to put in place. I also used silicone sealant to ensure airbox - cyl head connection. New model of Blow by valve highly recommended. Ps. new air filters has big tolerences. Be careful not to warp them when installing. Use lubricant. Anyway, right hand threaded was easy to find on local bearing shop. Problem is left hand version. They are not common. And then to other subject. Was riding today and made a few observation. Without db killer It is loud but not unbearable. On short trips loudness is fun but on long trips you get headache. 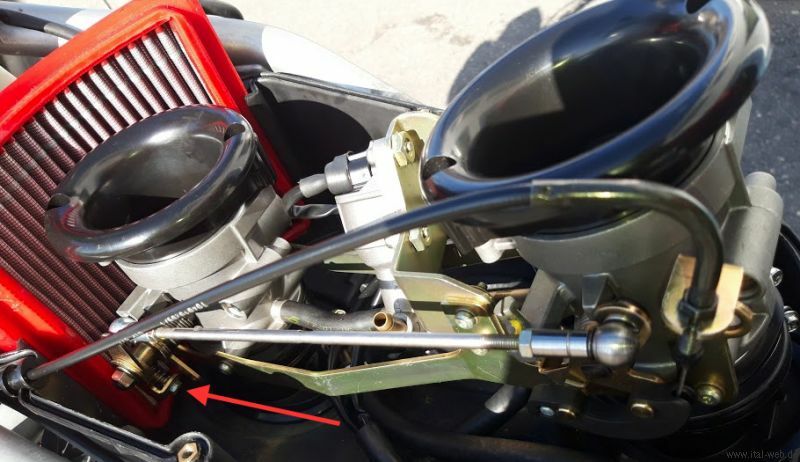 Balancing throttle valves properly is even more important than i understood from beginning. last summer i had bad stalling problem in town. Engine stopped on every red light when on idle. Engine also had strange sound coming from front(?) cylinder somewhere around 3krpm. After balancing both are gone. 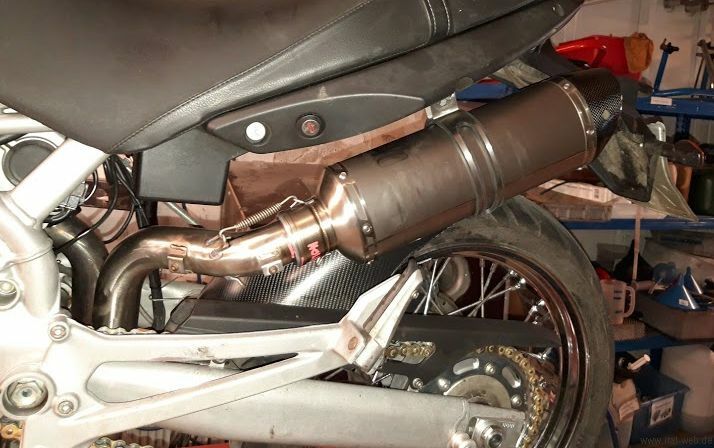 Exhaust is modified for better flow and it may help, but did it alone solve these problems, i doubt. Many people have been talking about stalling issue and they even blame neutral switch for it, but i bet stalling is very often cause of unbalanced throttles. And Paioli strut has at least too weak spring. Need to consult Motoville.